SUT L3 Tool Latest version v3.1.4 full setup is released and now available to free download from here. Here, in this post we have managed to share free direct link to download SUT L3 Tool setup file. If you wish to download it, then please follow the link provided at the bottom of this post. 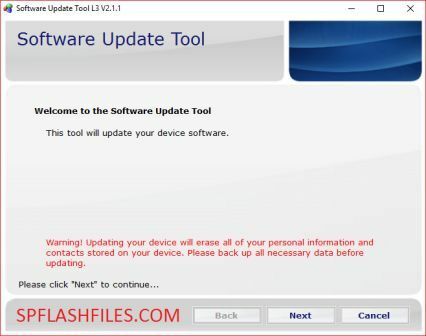 SUT L3 Tool (Software Update Tool) is software allows you to install/flash stock firmware on any Intel Chipset embedded smartphone and tablet. This tool is very simple to use and comes with friendly user interface, which helps you to easily load the stock firmware (ROM) in the tool and flash it on your device. SUT L3 Tool supports all types Intel fimware which comes with NBO and FFU extension. If you try to load any other firmware with different extension, then this tool with will fail to load / flash. SUT L3 Tool comes with inbuilt drivers, which means you don't need to install drivers manually. All drivers automatically gets installed on your computer when your run setup file of SUT L3 Tool . SUT L3 Tool is compatible with all version of Windows including Windows 8, Windows 8.1 and Latest windows 10. Remember: Please always take backup of your personal data from phone storage before using SUT L3 Tool as becuase during the firmware installation process all your data will be removed. 0 Comment "SUT L3 Tool v3.1.4 Download"